The Best Equipment That’s Right For You. something to fit everyone’s budget... with memberships as low as $18.88 a month. Don’t judge a book by its cover, and don’t be fooled by the label “level 1 Beds”! In fact, these state of the art tanning units are designed to build and maintain a perfect base tan while offering an exceptional value. It’s time to take your base tan to the next level! With wider tanning surfaces, additional cooling and high output bronzing facial tanners for a more golden bronze glow on the face, you can’t go wrong with this level. These State of the art units are designed to delivery outstanding tanning results with features once reserved for higher level equipment, all at an incredible value. More features, more tanning lamps, and more output is what you get when you upgrade to Level 3! These luxurious units feature higher bronzing output resulting in a deep, dark, golden brown tan, without as much fear of burning normally associated with the higher UVB rays found in lower level beds. If doing it standing up is your thing, level 3 usually includes use of all of our 7 to 9 minute bronzing stand-up units. When only the very best will do, our Level 4 units step up to the challenge! Sit back and relax in these luxurious air conditioned units and enjoy an experience that will relax you into euphoria. 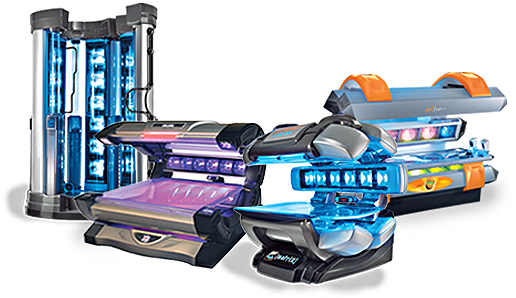 These units feature the highest bronzing output in their class that shower your body with a unique blend of light designed to maximize your own tanning potential. Tons of Comfort Features Including Mist Breeze, Climate Control, Aroma Therapy and More. The darkest tan possible and a tanning experience that is second to none! Immersed in light and seemingly suspended in air, the luxurious tanning experience showers your body with golden bronzing rays that feel like the sun, while the high powered fans cool your body like an ocean breeze. 99% UVA Light (Bronzing Rays) Limits Reddening of the Skin.